Two hearts in the darkness . 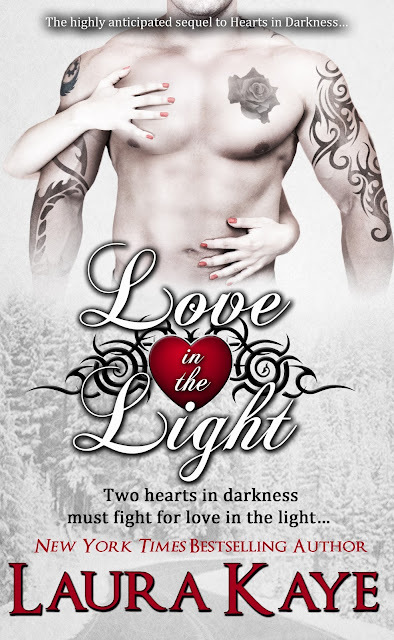 . .
Must fight for love in the light . . . Haunted by a childhood tragedy and the loss of his family, Caden never thought he’d find the love he shares with Makenna. But the deeper he falls, the more he fears the devastation sure to come if he ever lost her, too. When meeting her family doesn’t go smoothly, Caden questions whether Makenna deserves someone better, stronger, and just more…normal. Maybe they’re too different—and he’s far too damaged—after all . . . I absolutely loved Hearts in Darkness so I was thrilled when I found out Laura Kaye was writing a sequel. I couldn't wait to catch up with Caden and Makenna and see how they're doing as a couple after their unexpected meeting in a broken down elevator. This story picks up about 2 months on from where we left them, the couple have been pretty much inseparable since they met and they're both crazy about each other. Things have been going really well between them but Caden is still struggling with his PTSD and he's afraid to admit to his feelings for Makenna because he's convinced it's not going to last between them. Experience has taught him that nothing good ever lasts and he's just waiting for the floor to drop out from underneath him. I loved both of these characters from the moment we met them and nothing has changed that here. I'm so pleased that Laura Kaye didn't take the easy route and have love magically fix all of Caden's issues. It's not at all surprising that his past is still having a major effect on him and I really liked how that side of the story was handled. I particularly liked the way Makenna tried to be there for him and she refused to give up on him because she knew he was being affected by the past, she didn't always know how to get through to him but I think most of us would be in a similar situation and I respected her determination. I loved the way most of Makenna's family welcomed Caden with open arms, I did end up very annoyed with one of her brother's reaction to him though. Just because he has tattoos and piercings does not make him a bad person - he's a paramedic for crying out loud and obviously not some waste of space low life! That aside I enjoyed seeing him interact with her father and brothers, he's been without a family for such a long time and it was great to see him slowly start to relax in their company. The only thing that stopped me loving this as much as the first book was what I felt was the unnecessary and over the top drama. I can't really talk about why for fear of giving spoilers but there were two events that were far to similar to Caden's past and it was too unbelievable having them happen so close together. There was also something else going on with Makenna which was just a personal irritation of mine that probably won't bother anyone else as much as it did me. In spite of that I still really enjoyed this story. Caden reached rock bottom but I respected the hell out of him for managing to come out the other side and I felt the author did a fantastic job of describing everything he went though, I loved the scenes where he faced up to what had happened to him and meeting a few faces from the past gave him a wonderful perspective on the future. I loved Makenna for standing by her man and I'm glad that the two of them were able to work things out. Hearts in Darkness is a book I know I'll return to again and again but I'm not so sure about Love in the Light, I liked it and I'm glad I read it but it's not made it onto my favourites shelf. It's definitely still worth buying if you're a fan of this couple though, I was desperate to see them get their happily ever after and I'm so pleased with how everything worked out in the end.